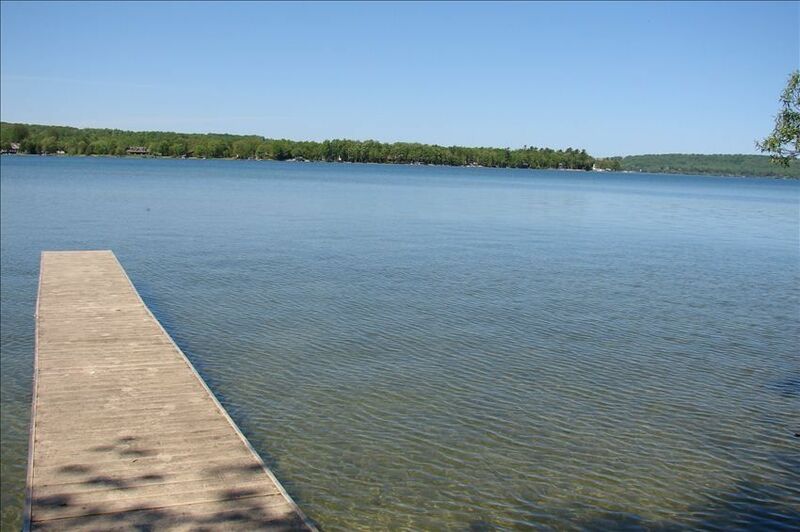 Directly on North Lake Leelanau with a Sunset View, sandy bottom and dock for swimming or a boat. Lake Leelanau is 27 miles long and has several destinations by boat and is also beautiful to look at. Cottage is very clean and well equipped. Renter has reputation for very clean rental properties. This cottage is between Suttons Bay and Leland and is close to wineries, beaches, restaurants, golf and shopping. Come up north to Lake Leelanau and create memories with your family and friends. Private road perfect for peace and quiet - paved driveway. Nice swimming area and ladder on dock. Classic “Old School” Leelanau cottage with ALL the amenities! We loved our stay at this classic North Lake Leelanau home! It has everything you want/need for your stay Up North! The accommodations were very clean upon arrival and while decor hasn’t been updated in awhile, there is no need as we spent the majority of the time on the deck, dock and by the fire pit at night! The fact that there is excellent internet and satellite TV made the few rainy evenings very “modern!” The home is in a great location. Close to many wineries, bars, restaurants and breweries. This is our favorite vacation area for the past 40 years and this is a home I would definitely rent again in the future. Thanks for the review! We are so glad that you chose this spot for your vacation! Come back and see us in the fall! Autumn colors are a knockout - the water is still warm enough to swim - the crowds are gone .... it's our secret summer! The house was ok,plenty of room, Only problem was the smelly water,we had to buy water,and take showers at my brothers house. We hope you enjoy the rest of your summer! This is a cottage is in a great location central to the county. It is clean and comfortable. Thanks for staying! We are so glad you enjoyed your stay.